Randall Munroe left NASA in 2005 to start up his hugely popular site XKCD ‘a web comic of romance, sarcasm, math and language’ which offers a witty take on the world of science and geeks. It now has 600,000 to a million page hits daily. Every now and then, Munroe would get emails asking him to arbitrate a science debate. ‘My friend and I were arguing about what would happen if a bullet got struck by lightning, and we agreed that you should resolve it . . . ‘ He liked these questions so much that he started up What If. 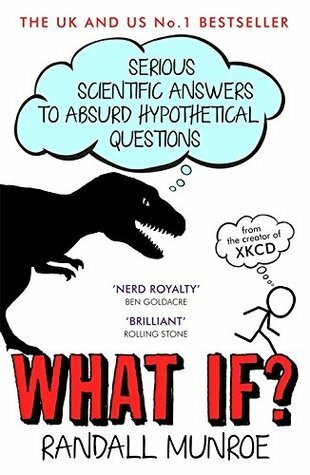 Far more than a book for geeks, WHAT IF: Serious Scientific Answers to Absurd Hypothetical Questions explains the laws of science in operation in a way that every intelligent reader will enjoy and feel much the smarter for having read. When I saw this I picked it up straight away because I had to read it. I have been a massive fan of Munroe’s comic XKCD for years and now with a chance to read an entire book filled with the humour and science of the comics was hard to ignore. The premise of the book is Munro answering What if? questions submitted by people through his website. As the tagline explains: Serious scientific answers to absurd hypothetical questions. Not all of the online submissions were answered and there are a few “Weird (and Worrying) Questions” highlighted to show some of the stranger ones which are a delight in themselves. Munroe amazingly has a lot of maths and science to back up even the most absurd questions, and even when things aren’t logically or physically possible, he works around it with a slight bend of physics or realistic possibility and shows you how it would happen if all the cards fell perfectly. What makes this even more fun is the book is filled with Munroe’s drawings, simple interactions between his stick figure characters and illustrations of how these various scenarios would play out. It’s not just comic conversations, there’s also drawings of explanations and Munroe adds tables and graphs, all in his recognisable style. Some of the questions are common ones such as “What would happen if absolutely everyone jumped at the same time?” But along with actually answering the question (short answer: nothing) with clear and understandable science, Munroe takes it a step further and gives another fascinating yet horrifying answer which you don’t think about. This was when I first really truly realised how marvellous this book was because Munroe takes it a step further and looks at what happens after that when you have 7 billion people in one location having just jumped who now need to get back home. Short answer: chaos. There is humour and excellent jokes and the footnotes peppered throughout are a delight in themselves to read, also a mixture of genuine sources and Munroe’s own thoughts. One of my favourite questions is “What would happen if you made a periodic table out of cube-shaped bricks, where each brick was made up of the corresponding element?” A question which is logical enough, but it is the drawings that go with it that add an extra layer of brilliance as Munroe tries to explain not only how some of them would just float away, but how each box would react differently with the others nearby. If you like maths, science, XKCD or love knowing about things then this is the greatest book. If you aren’t into these things it is still readable because while it isn’t entirely dumbed down, Munroe explains it in a way that you can still understand, and with wonderful cartoons to accompany explanations you still have a lot of fun learning.